Yay! I was excited to learn about this after the drama finished airing. 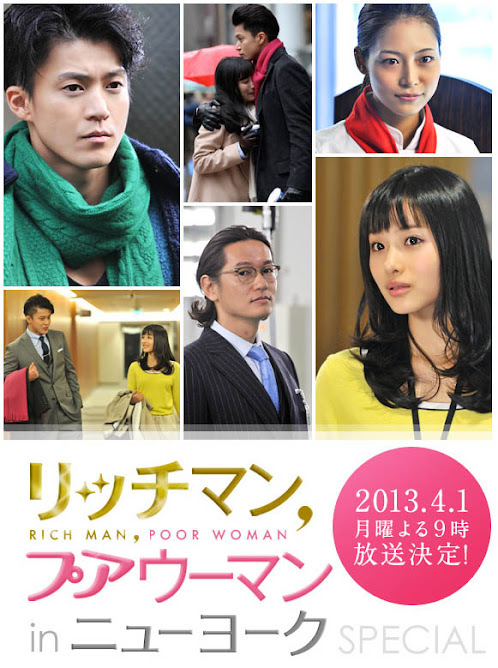 Rich Man, Poor Woman was one of my favorite Japanese dramas from 2012 along with ATARU, both of which had specials airing this year. 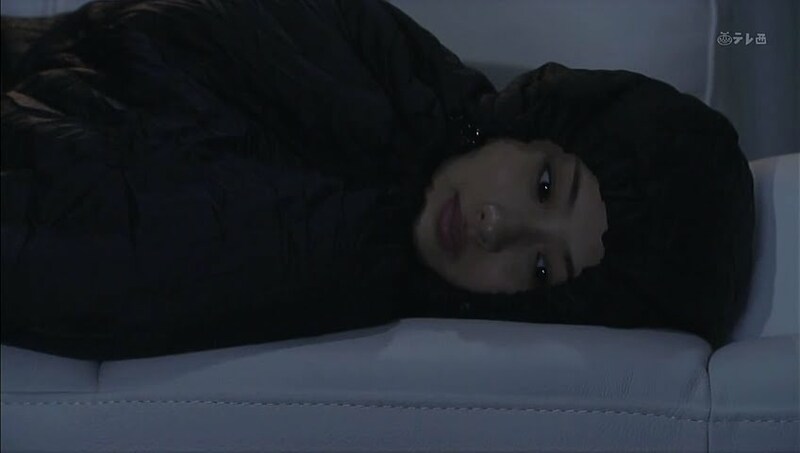 I still haven’t broken down and watched the ATARU SP after hearing someone say it’s a lot of recapping of previous episodes. Anywho, my favorite OTP is back! Of course, we do open with a brief introduction and recap of the events of the series chronicling our leads’ love and their difficulties. I won’t waste time on doing any brief overview of the series. If you want that, see the recaps. I will say this much that the events here happen between the time that Natsui goes to Brazil and when she comes back where the series officially ended. We open officially in New York with Toru heading into a computer manufacturer. He starts up a translation program on his phone in order to communicate with the person in charge. What does Toru want? All the hard disks being produced! Of course…his translation app doesn’t seem to be working very well. 😛 Hard to believe if it’s a Toru invention, ne? He repeats himself and the man in charge gets angry and says he hears him and goes off. Meanwhile, Yamagi is NOT happy to learn Toru is in New York and then heading to Boston. Looks like there’s something important going on that Toru definitely needs to be present for. 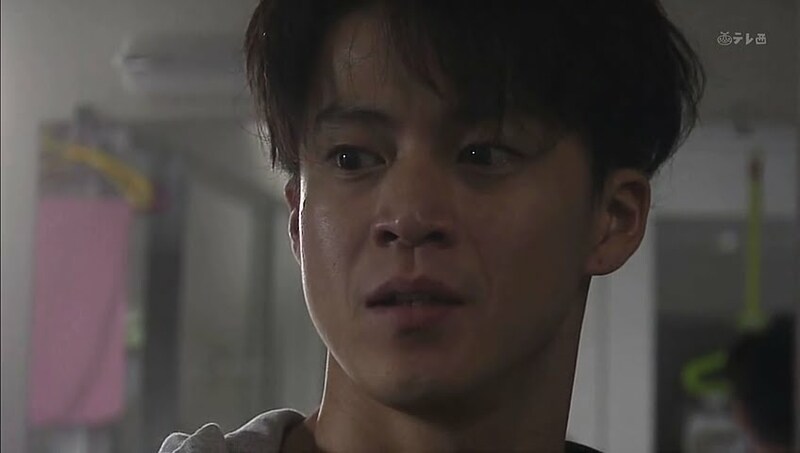 Toru promises to make it back in time and that him leaving for New York was to benefit the team. So let’s flashback to the day before, shall we? Toru is holding a meeting at the company and asks if their personal file project is boring. This shocks everyone and they hesitatingly say no. Toru then explains that even if all of your information is handy and in one spot, that doesn’t mean people will know you. Toru then talks about family photos, childhood drawings, nasty texts sent to exes—that all makes up who you are, right? He is envisioning having one space to keep such records safe. Uh…some of that sounds okay and other parts just sound odd given the original scope of the project. Who wants to keep angry texts to their ex? Toru then says he wants to ad a personal storage option to the personal file project. Of course, this could be quite difficult, but if they get user participation in building it, things should go smoothly. 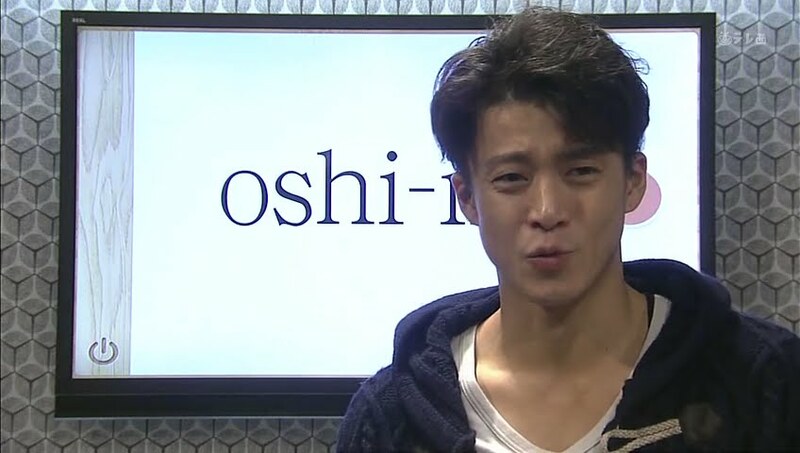 Toru then proposes the project be called “oshi-ire.” It literally translates to “closet” I think. Of course, the staff aren’t gung-ho about this idea. The personal file project is already 9% done. This means taking everything back to the drawing board and starting over. You may not think that 9% is a lot of work, but let me tell you, when it comes to designing and programming, that’s a helluva lot of time and effort already. Toru just smiles and says it can’t be helped because that is what he thought of. Just like Toru. 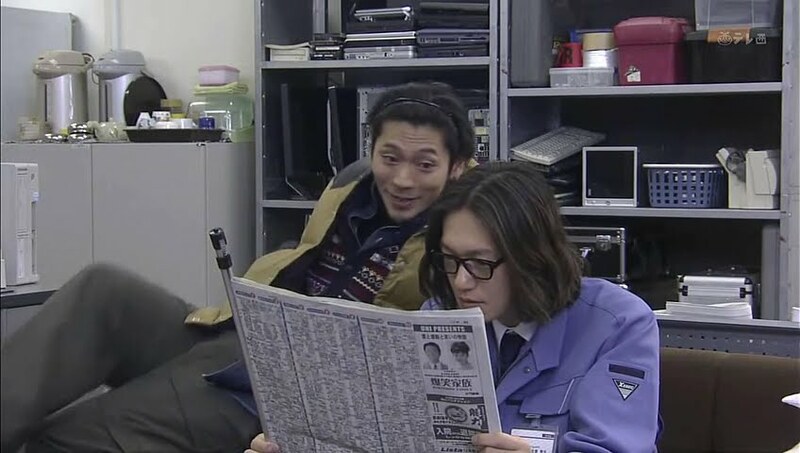 We then end our flashback and Toru is reading out the specs to the factory leader who is not being very helpful and just tells Toru to add his name to the list. Toru chases after him saying that in a year, the man could create such hard disks at a faster pace, especially if Japan took the technology and advanced and compressed it. The man then says that the Japan technology has stagnated already for 10-20 years. I don’t know about Japan per se, but I don’t think the Asian technology market has stagnated. 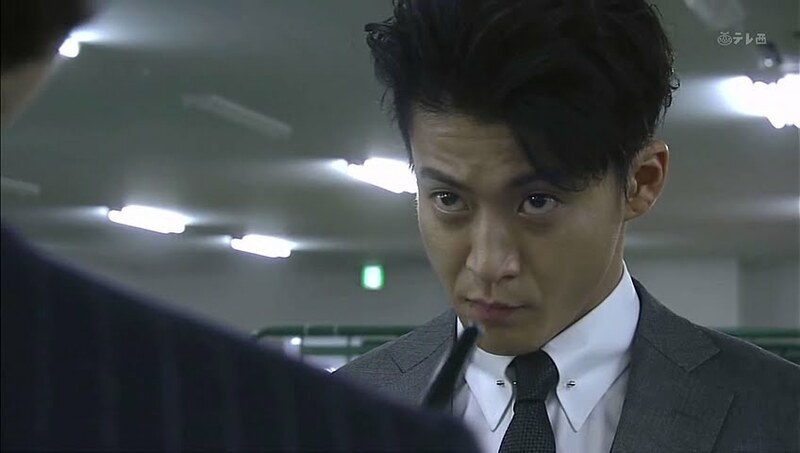 The factory leader then goes over to the owner and calls Toru crazy and the two laugh at him. That’s very unprofessional. Meanwhile, our heroine Natsui is given a presentation (all in English) about the stuff she has been working on in the lab. Kudos to Ishihara Satomi doing her best to say all that convoluted medical jargon. She is praised for her presentation. This makes Natsui very happy. She then catches a taxi and rushes off. She give the driver a GPS and says that she wishes to travel to the blue dot where her “man” is waiting for her. LOL. Natsui reaches the destination, but has problems tracking down Toru. She tries calling him, but can’t make it through to his cell. This makes her even more anxious as she apparently is running on a tight schedule. Are they not meeting any more? Then up comes Toru on his phone talking about using the Internet to share data and information is a practical way of “meeting.” Natsui turns around and Toru puts down his phone and says it’s regrettable that in this situation the only effective way of communicating is “meeting.” Natsui happily smiles and rushes up to him. The two are soooo cute together. Toru reminds Natsui about her dropped purse and bag. She rushes back to get them and he grabs her arm. The two then go around the city and film their date. There’s nothing wrong with filming it, but I just find it strange to film absolutely everything. Anywho, a lot of really cute scenes here. The two then take a break and Natsui buys some coffee. As she brings it over to Toru, he snaps a picture of her and then says something is different. He holds his hand up to his eye like a telescope and says she seems more mature now. LOL. She then puts the hot coffee against his cheek. Yep, more mature indeed. The two start walking and Natsui talks about how happy she is to meet with Toru. He reminds her that he saw and spoke to her already that morning to the point where he almost didn’t want to hear her voice any more and wanted some time apart, but her silent face seen from the side is refreshing. When does she have to leave? At 7. Toru says he has to fly out to Boston for another meeting afterward. Natsui finds it regrettable, but Toru is most handsome when he’s working, so it’s fine. She then smiles and asks Toru to make an app that can freeze time. Toru puts his arm around her shoulder and hugs her to him. Evening falls and Natsui has to leave. 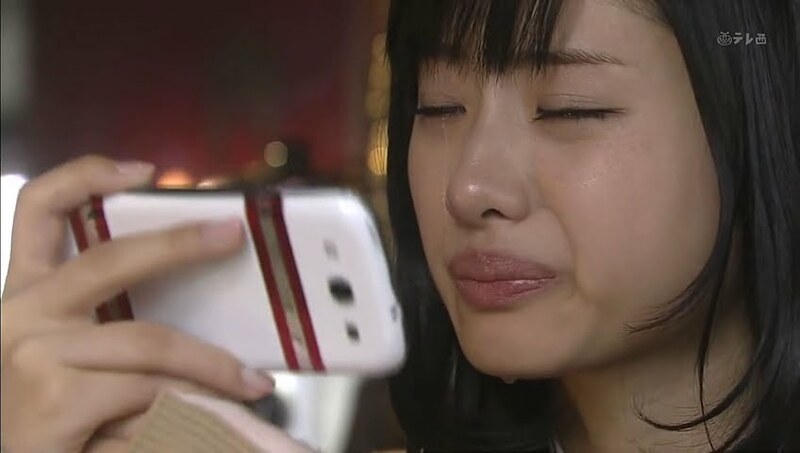 As they say goodbye, Toru’s phone rings. Natsui smiles brightly and encourages him to take it. 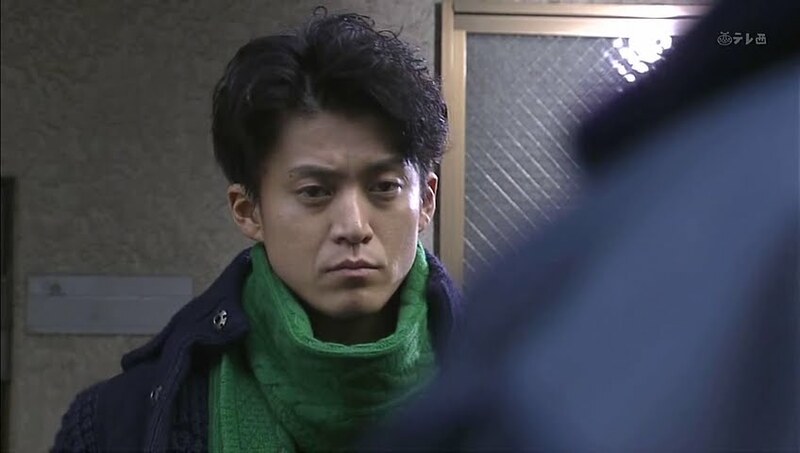 Toru looks sad and conflicted as the cab drives away and he answers his phone. A few weeks later in Tokyo Toru is having a celebratory dinner with a group of women he helped design an application for. 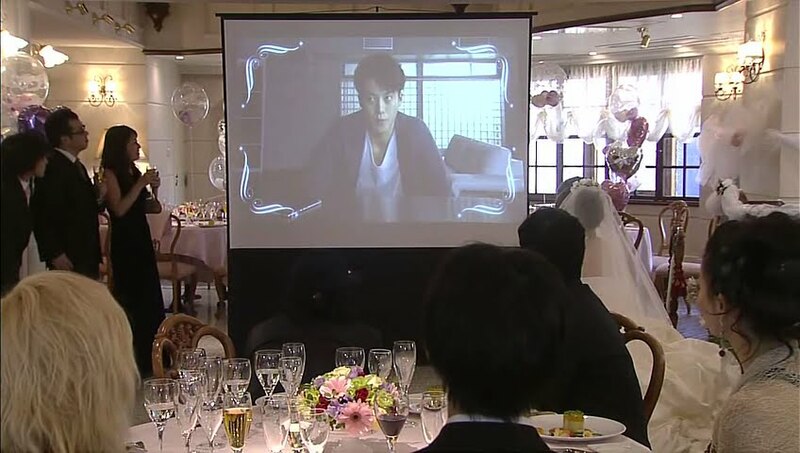 As they are making a toast, the women see something behind Toru and scream and runaway. Toru turns around and there stands Natsui, a bit weather beaten. Toru’s champagne goes flying out of his mouth. He then laughs and says virtual things are becoming more real. He pokes Natsui’s cheek—they even feel warm. He sits back down and Natsui comes over and asks if those girls were virtual as well. She then shows him her tablet which is how she found him (the girls uploaded a group picture with him in it). She then pokes his cheek and the girls scream again. Shakes head. So silly. Back at Next Innovation, Toru asks what Natsui is doing there. She came since it is the Carnival holiday in Brazil. For this one week, Rio has no work. Toru complains about such a carefree company and tells Natsui that she cannot possibly stay at his place. She says she knows this already and will find somewhere else to stay. She then smiles as she watches Toru go back to work. Then enter our trio. Wonder Wall is now working with Next Innovation since Wonder Wall had too much work and not enough resources to keep up with the demands. Yasuoka smiles and says that Wonder Wall is clearly catching up with Next Innovation. Our other two then say it’s great Natsui is back since she can attend Yasuoka’s wedding. He’s getting married? To who? His fiancée pops up and hands Natsui her invitation. The two even have pet names for one another. 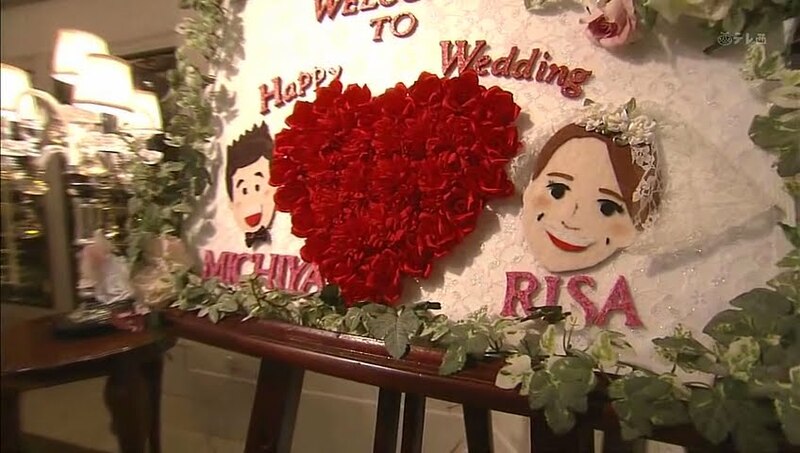 Yasuoka is Sacchi and his fiancée is Micchi. Toru comes up behind Natsui and complains about the two being sickening lovebirds. LOL. Natsui looks back at him and asks what it was he called her again. Say what? Natsui tells him to never mind and Toru walks off. Natsui gets ready to head out and Micchi asks how long she is staying. Only about a week. She has to rush to find a cheap hotel. 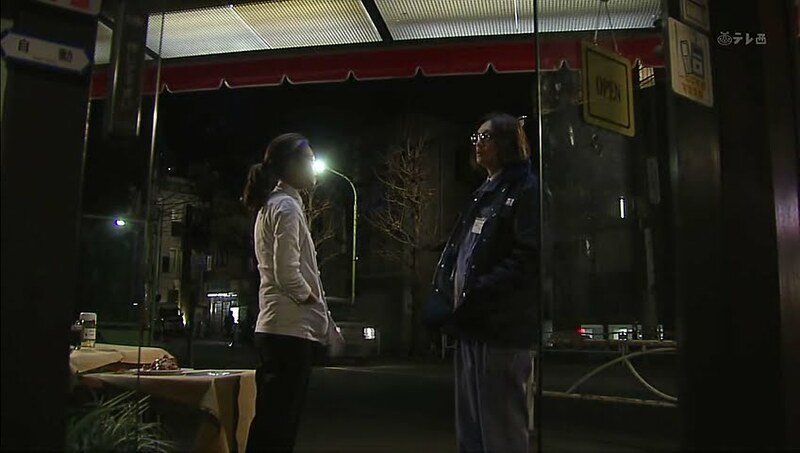 Toru mutters he knew it and Micchi tells her that she shouldn’t have to as she should just stay at Toru’s place. Yasuoka rushes over to Toru and tells him to manly tell Natsui “come to my place.” LOL. Can you imagine Toru doing that with his personality? He then pushes Toru towards Natsui who forces a smile and looks rather uncomfortable just as Toru does. Natsui does end up at Toru’s place, but it is very awkward. She is horrified to see in the bathroom that the toilet and shower area is see-through. She then goes out into the house and is shocked to see how it (still) has nothing in it. Toru says it does, too. He then opens his fridge and motions towards his couch. He made the decision for those two items after only six months. That’s rather good given Toru time. LOL. He takes out drinks and then rushes over saying he’s found three good tables he’s considering. Natsui stops him and asks where he sleeps. Toru points at the couch. Isn’t that bad for your health? Toru points out unnecessary clutter is far worse. That night, Natsui is rolled up in a sleeping bag. She asks Toru if that isn’t weird. Toru doesn’t find it so at all. She was the one who asked for something like a futon or a blanket. Natsui replies that she didn’t think he’d give her a sleeping bag while he slept on the couch. Toru then gets up and picks Natsui up to put her on the couch instead. She screams the entire time he does this. Toru then curls up on the floor with nothing. No more complaints, right? Natsui then asks if Toru’s body hurts by sleeping on the floor. Toru replies that he’s used to it. Natsui then asks if he can unwrap her a bit. Why? Is she itchy? No, she just wants to be assured that he’s within reach basically. Toru gets up and sits Natsui up. He then unzips the top half of the sleeping bag and tells her to go ahead. Natsui smiles and reaches out her hand to cup his cheek. She says his face is cold and asks him to buy a futon. Toru smiles and touches his cheek. He then puts his forehead against hers and says she’s warm. This makes Natsui smile and Toru pulls her into a hug. These two have come soooo far in their relationship. The next morning, the sleeping Toru wakes up to the sound of chopping. He blearly looks towards the kitchen and his eyes widen in shock. There’s pots, pans, utensils, and a rice cooker. Toru looks absolutely horrified. He asks Natsui what is going on. She woke up early and went out shopping. What is all that stuff? The basic living necessities. 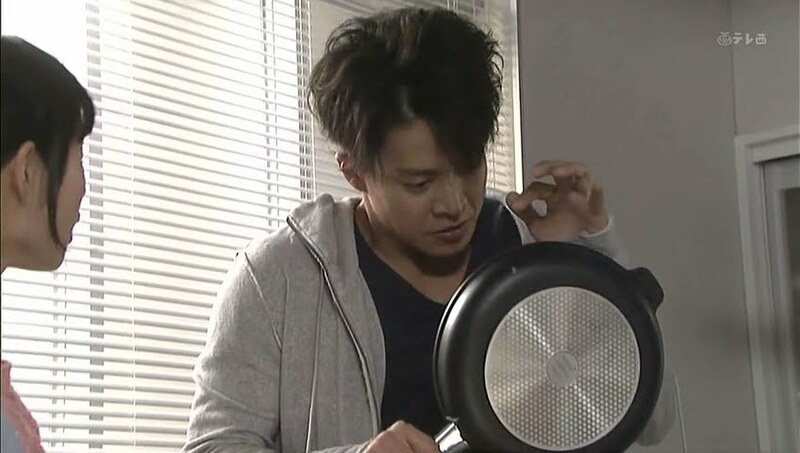 Toru continues to watch on horrified as she breaks eggs into a pan. He rushes off to the bathroom where he receives even more shocks to his nihilistic living. The bathroom is full of new objects and towels. Is that really necessary? Omo. The next scene. 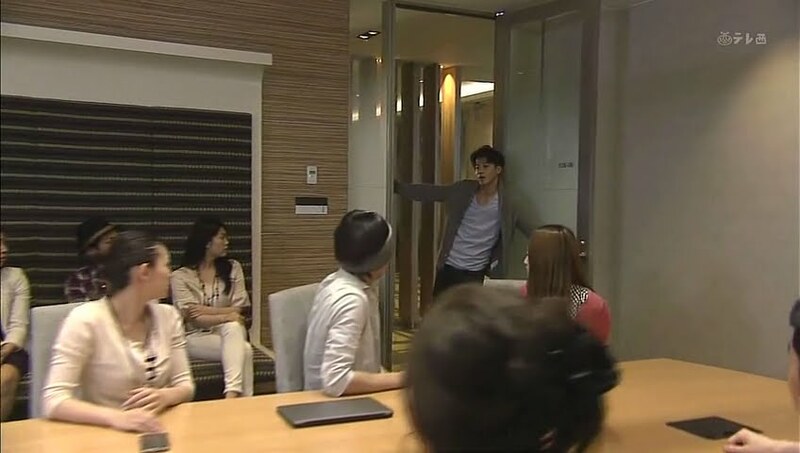 This drama always had its ability to make me laugh with our OTP’s antics. So, after frying the eggs, Natsui goes to fry bacon as well. Toru rushes out horrified yelling that she can’t. He holds up the pan that has a speck of egg on the outside. If she uses it like that, the pan’s proper functions will not be utilized. Natsui vows to wash it first. Toru then puts something on the fridge and tells her she is not allowed to move it even one millimeter. He then tells her to take the unsightly rice cooker with her when she leaves. The two then head into the bathroom where Toru complains about the bear towel. She tells him it is more convenient to lose if its hanging. Toru says towels are meant to be folded on shelves, used once, and then tossed away (I’m hoping he means they get washed and not literally thrown away—what a waste). Natsui then says a towel hanging by the sink is more convenient and something ordinary households have all the time. Toru is horrified by the idea of reusing a wet towel. How foreign. We use the same hand towel in the bathroom for a week unless it gets really dirty. Natsui then reminds Toru about his pan rant and asks if he doesn’t feel sorry for the poor towel rack that never gets to do its job properly. Toru’s eyes look like they will pop out of his head. He takes the towel and throws it at her as he would never approve of such a design. He then rips off the towels Natsui had taped to the toilet enclosure saying he wouldn’t peep. We then cut to Asahina who is a common worker in some company. He still does tech stuff, but not like what he was doing for Next Innovation. His coworker (who calls him Hinacchi) is thinking of quitting the job and asks if there is a bright future waiting. Asahina can only say he doesn’t know. After work, he goes and greets a kitty he bought food for. Enter his little sister. He asks Yoko how she found him so fast and Yoko shows him a questions she posted on the net about his whereabouts which received a surprising amount of answers. Asahina smiles. The people who really know him have all but forgotten him, but he’s still famous online. Yoko asks Asahina to come home, but he refuses saying he likes living his new life—she should try it sometimes and come visit him once in awhile. 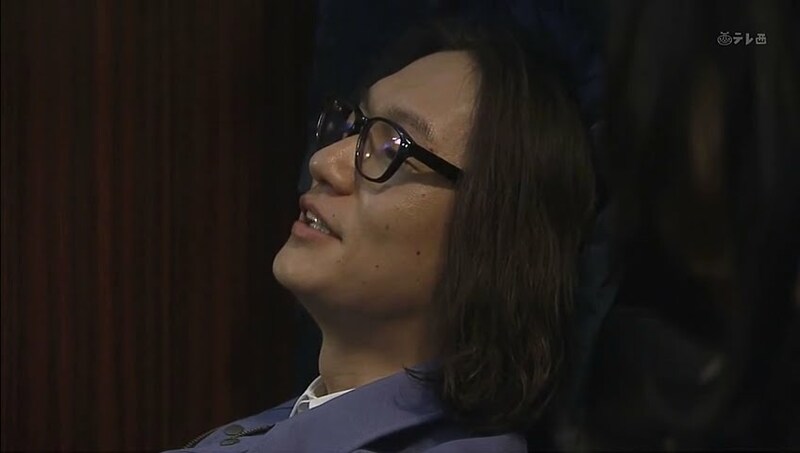 Meanwhile, Toru is in a meeting with JI Tech about the personal file project. He is livid that they want to install ATM-like machines in various places around the country for people to access their information. Toru reminds them that accessing it at home was the true aim. Be that as it may, what about the security issue problem? The fastest it can be solved is a year. Toru vows to solve the issue in six months if that is the main problem. JI then complains about the slumped economy and how they can reap the most benefits and money by installing these consoles across the country. This makes Toru snap—who was the project designed for? Natsui goes out to lunch with her colleagues and happens to overhear Yoko arguing with someone. Both women are surprised to see one another. Natsui asks if Yoko quit the restaurant and Nogi quickly refutes this. Ahhhh! 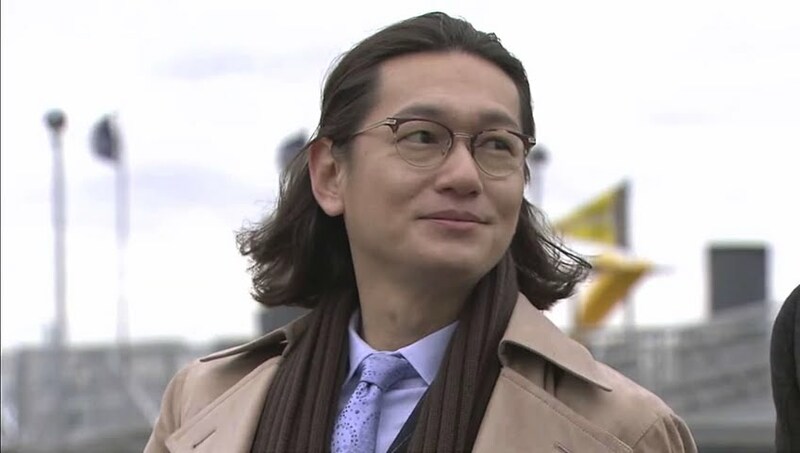 I love the actor playing Nogi. 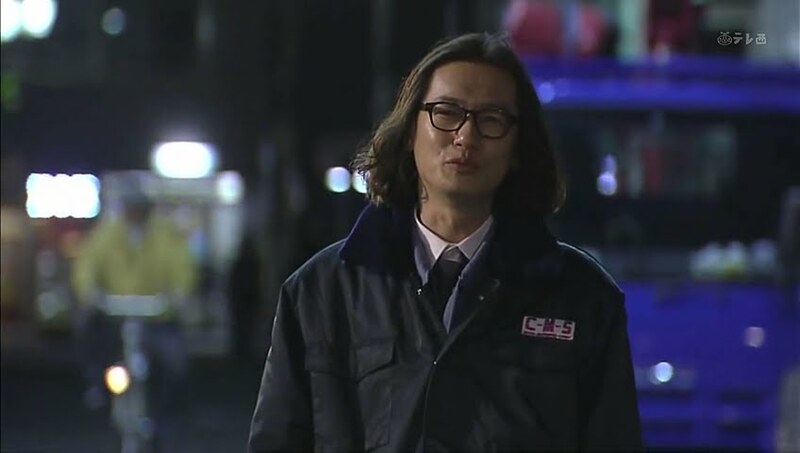 I finally noticed him for the first time in this drama and going back and rewatching some other favorites, I noticed him as part of the cast as well. Natsui then turns to Nogi and tries to chase him off, but he’s staying for lunch. Yoko cooks and explains that Nogi is running the restaurant. Her goal is to save up money to open her own. 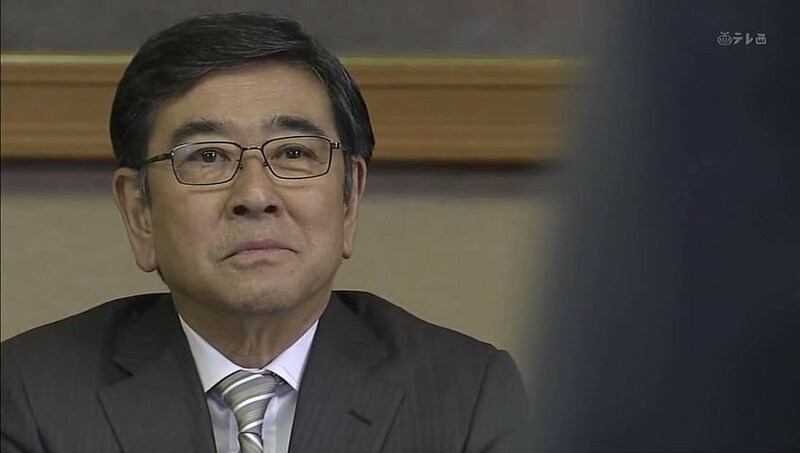 Nogi sits in his corner and mutters about how they could just run it together. Awwww. His crush on Yoko hasn’t faded one bit. This makes Natsui smile. Yoko then asks how it was to meet up with Toru after such a long time. Natsui’s smile stretches to the point of breaking and she says that it’s somehow already become troublesome. 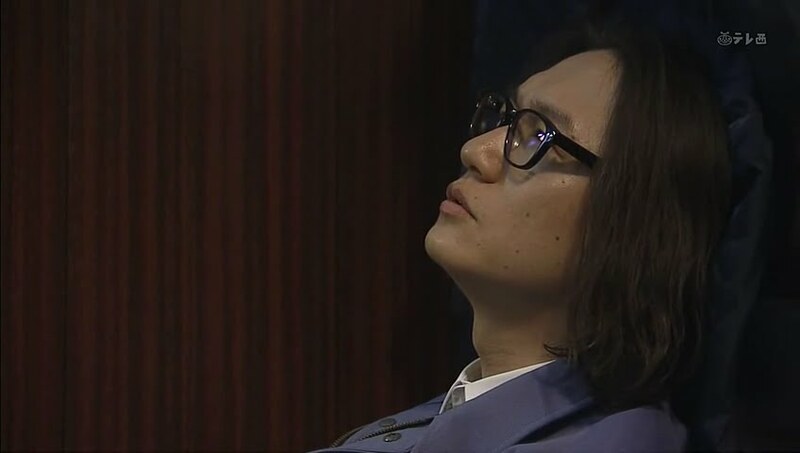 Toru angrily goes into his company’s meeting room and asks if they agree with JI Tech. They do. The P-box idea is the best place to start since the software support for PC security issues will take longer. This angers Toru. So what? You drop it just because it is difficult? Is it okay to discomfort the user because it’s better for the maker? Toru is right about that. In an industry providing services to consumers, what is the right balance between good for the user and good for the provider? His employees point out that this is what JI Tech is pushing for and they are the funders. Toru doesn’t care. There is one person who would push the issue—Asahina Kousuke. This shocks everyone. This gives Toru an idea and he runs from the building. Asahina reads the news and is shocked to see an article about Next Innovation stock falling with the return of Asahina Kousuke. Just what is going on here? Toru comes and says it’s just like it says. Asahina then complains about Toru doing this without telling him. Toru knows that if he had asked Asahina, his old friend would have just straight up rejected him. This way, there is a higher chance of Asahina joining him if it’s already been publically announced. Asahina says the rumors about Toru becoming an honest man were just that—rumors—as Toru is still as pushy as ever. Toru says it has been quite awhile since he’s done that and it makes him feel good. 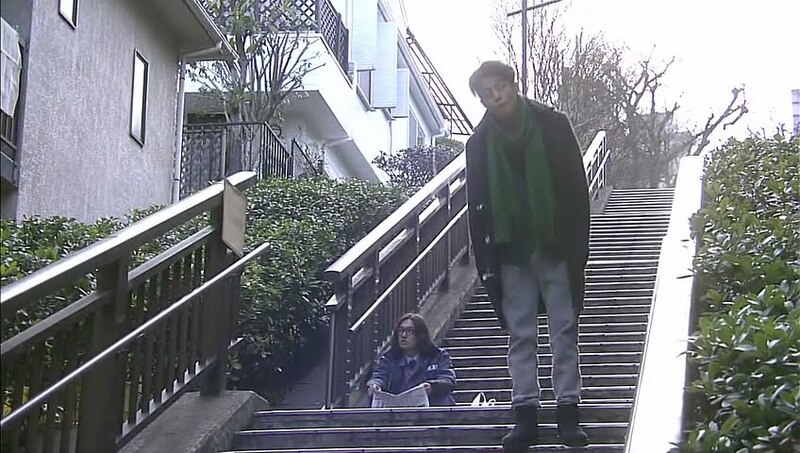 Toru turns and faces his friend and asks if they cannot join hands once more. Asahina replies that it is impossible to return to Next Innovation. Then…they should just start a new company, right? This surprises Asahina. Toru then says that his staff says something is impossible and too difficult. Toru says he understands if the staff was reluctant because a project was boring…but because it’s difficult? What is up with that? This makes Asahina smile. Toru then says they created the company not caring about the hours or the hardships. Asahina asks if Toru will just throw Next Innovation away. Toru says it’s fine as it is just like him to do that. They can start in that dumpy little apartment. Toru is fine as long as he’s with Asahina. Asahina looks very uncomfortable. 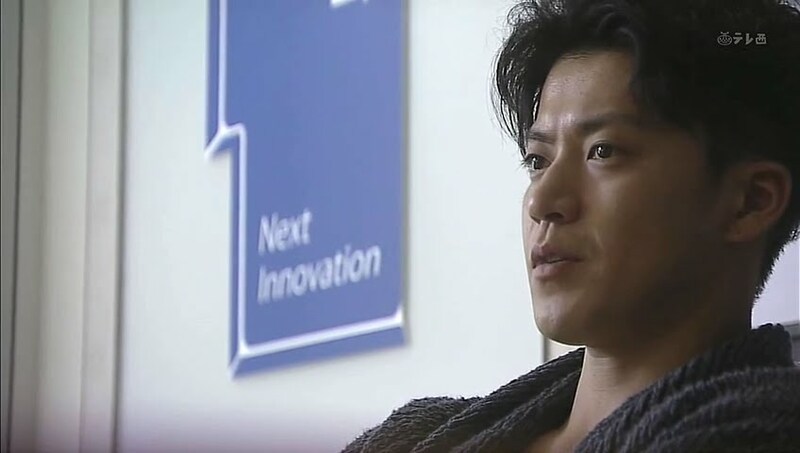 He gets up and tells Toru that they don’t need to start their own company as history will just end up repeating itself. It’s only natural for a company to ripen when people with different skills, speeds, and ideas gather. Next Innovation became that big and now , there’s so much more that Toru can accomplish. Asahina then asks if Toru is just afraid of the view he has never seen before. Did Toru really think of changing the world back then when he had no money, people or status? Now that he has it and can actually change the world, then he should just do it. Toru needs to fight so things just don’t end this way. Toru smiles and says Asahina told him off again. Toru then vows to put on a fight that will make Asahina wish to return. Toru goes to leave and pets the kitty saying that “you are the one to find comfort in running away.” He then straightens and holds out his fist before leaving. Natsui learns that her lab has been taken over by an American drug company which was the reason behind her return—not the Carnival in Brazil. Natsui is shocked by this news. She does, however, insist that she will not quit since this was her hard found job after 32 rejections. Her coworker tells her that if she chooses to work for the American company, Natsui will find it hard to ever be able to return to Japan. This also surprises Natsui. That means no family, no Toru. That’s impossible. Natsui then become depressed as she thinks about having to job hunt once more. Natsui returns to Toru’s apartment and is sad to learn that he really didn’t come home (he sent her a text saying he had work to do). She then gets an alert about the breakdown between JI Tech and Next Innovation. She sets about cleaning and wondering if she should go to America or not when Toru finally returns. She asks him about work and he says he’s on a roll and having so much fun. He goes and washes his face and inadvertently uses the hanging bear towel he hates so much. This makes Natsui smile—see, isn’t it useful after all? Toru just says it was a mistake as he was distracted because of work. He then throws his scarf at Natsui. She asks if he will be able to make it to Yasuoka’s wedding if he’s working so hard. Toru says that he will not miss it even though they are unbearable lovebirds. Natsui then says she came back suddenly and has no clothes to wear. Toru tells her to just go out and buy something then. Can’t he go with her? He always told Natsui that she has zero taste, so she wishes for his help. Toru refuses and tells her to pick alone as he wishes to sleep. However, he does break down and go with her. Ah, I’m reminded of the first or second episode when Toru took her shopping for the first time to impress that congress woman. Natsui tries on clothes that she likes which all get rejected. Toru then gets annoyed and gets up to grab some clothes for her to try on. When she comes out with a pink trouser one piece, Toru is enamored. He nonchalantly tells her to get that one. His choice surprises Natsui, but she is pleased. The two then go home to his apartment. Toru sleeps on the sofa while Natsui happily plays with his nose. She then gets a call asking about her decision and she says she is staying in Japan as there is someone she wishes to be with. Toru is called into a meeting early in the morning with his staff. They wish for him to face reality and just go with the P-box plan by JI Tech. They don’t believe all-nighters should be pulled for something that will probably never come to fruition and is premature at this point. 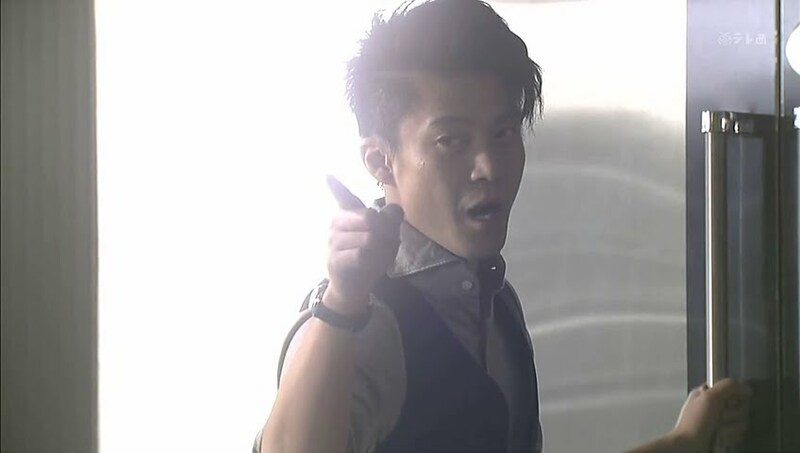 Toru scolds them for using excuses to run away from the difficulty of the project. The staff then say they will all defect to Wonder Wall if Toru refuses to listen to reasoning. 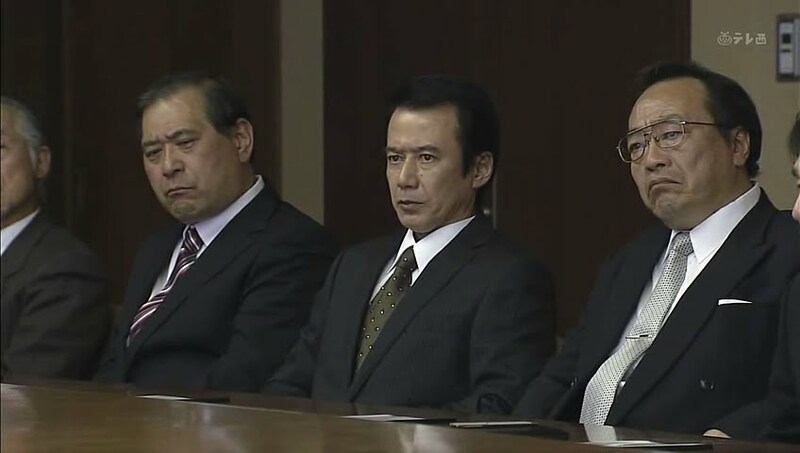 Oddly enough, it is Ogawa and Hosoki who do vow to stay with Next Innovation and do the work of five people to help Toru out. After the meeting Yamagami has to have his say as well. He understands Toru’s view point, but he needs to withdraw Asahina’s return. If their former colleague returns, the company’s reputation will tank. Toru believes good results will solve that problem. Yamagami gets up and before he leaves wonders if Toru believes him to be so mediocre that he can’t get the job done? Toru sits all alone and wonders when his company became so worthless. Meanwhile, Natsui is giving her decision to S-Tel about the merger and moving to America. She smiles and says she feels that even if she quits, she will be able to find work elsewhere. The two men interviewing her ask if this is because the success of her presentation? She has quite the confidence for someone who has worked only a year and was merely reading of statistics. Wasn’t her goal to be a researcher? Aiyo. Natsui looks at the pantsuit and wonders what she was thinking of. 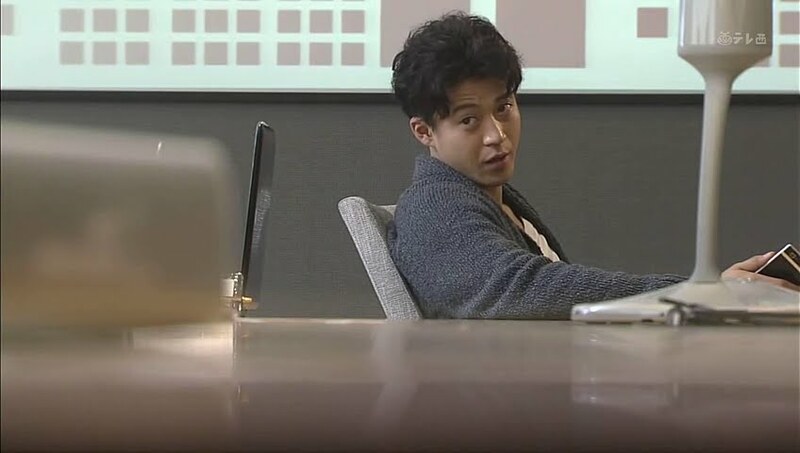 Toru then comes in and says he’s only there for a change of clothes as he has a lot of work to do. Natsui then broaches the subject about if (just if) she lived abroad for good…will Toru be lonely? He says nothing and Natsui asks if he’s listening. Toru says he has no interest in such a frivolous game. This hurts Natsui. She talks about wanting to cheer him up, but he replies her plan backfired as it only irritated him more. Natsui asks if he thinks his company is the only one with problems. She goes to tell him what’s going on at S-Tel, but Toru again ignores her and says that employees just merely working for wages only have their own benefits in mind. Is that really what Toru thinks? Does he really look down on his employees like that? Toru says he doesn’t, he’s just raging. He then goes on about how they choose comfort and ease over a difficult challenge. Give them credit for some of their work and they suddenly become self-assertive. Natsui says they are just working hard thinking they have found the place where they belong. She then talks about the company making sudden changes, but Toru cuts her off. The employees should just follow the company. Following directions for money is the exchange for inefficient people. This hurts Natsui even more. She had thought Toru would change after experiencing such betrayal, but he hasn’t. Toru says he gets it and tells her to leave him alone as this is his house. Wow. Way to make Natsui feel even worse about her own situation. Is that how he really feels? Has he really disliked her being there the entire time? Natsui then says that whenever anything doesn’t go his way in the home or workplace, it’s inexcusable. Toru stands and yells that he dislikes anything that disrupts how he does thing. So that means he’ll never be able to get used to someone living with him, right? Silence. It’s broken by Toru looking down and saying it was better when they were apart. When they are together, Toru cannot be himself. Ouch. Natsui fights back tears and laughs a little. She then apologizes for being a hindrance to his “comforting” lifestyle. She grabs her coat and heads for the door. Toru then takes the pink pantsuit and throws it at her. Natsui stops and picks it up. It made her really happy that he bought her clothes. It made her even happier to know that he though she looked good in them. She thought Toru saw things in her that she didn’t even see in herself and she could discover them and become a new person. Toru, however, doesn’t care what people think does he? Natsui leaves and wanders around Tokyo. She sees a sign for self-entertainment spaces, but realizes she has no money as she forgot her purse. She walks on dejectedly when Asahina passes by. He looks at her back and says she seems somehow defenseless. Two guys then approach Natsui and ask her to go with them to karaoke. Natsui tries to avoid them, but they won’t leave her alone. Asahina then comes and grabs her around the neck. She immediately screams. Asahina apologizes to the two men saying he will be taking her. Natsui turns her head and is shocked to see it is Asahina holding her. The two go into the internet café and Natsui comments on how surprisingly familiar Asahina seems to be with such places. Asahina tells her he became familiar with them when he was not able to rent a room. The two go into one of the private rooms and Natsui tells Asahina about Toru’s unsuccessful trip to New York and the new “oshi-ire” project. Asahina is familiar with the phrase. Toru once said that since he was abandoned by his mother, his closet was only empty with no childhood memories or trinkets to fill it up. This makes Natsui feel badly about what she had said to Toru earlier. Natsui reveals what she said about Toru not being able to live with someone else. Natsui then says she just didn’t want to recognize the truth that she was a hindrance to Toru. Asahina quickly assures her that isn’t the case. Natsui then tells him that Toru is not the same person who hurt his feelings earlier. Toru had changed since starting fresh with Wonder Wall. So what next? Asahina says that Natsui always thinks Toru can become something even more wonderful and great while Asahina always kept on telling Toru that he’s fine like he is. Natsui smiles and says that Toru will surely become even more impressive—not that she would know about it. Asahina then gets a call for work. He complains that they always come late at night. Natsui tells him it’s okay for him to leave her and he tells her that she can go crash at Yoko’s. The two then part ways and Natsui calls after him asking if he himself will not change. Asahina doesn’t answer this and only waves goodbye. Natsui seeks out Yoko who can’t take her in since Yoko has moved back in with her parents. Miichi then comes and invites both Yoko and Natsui to her place. Why? She has them doing stuff to help out for the wedding which is only 4 days away. Risa had decided she wanted everything handmade for the wedding, but there is too much for her to finish by herself. Thus Yoko and Natsui work hard to help while Risa wonders if she should add a tiara to her wedding outfit. Yoko cannot believe there is such a woman out there. Natsui smiles and says it is women like Risa who should easily find happiness. Natsui then tells Yoko and Risa that she might be going abroad to work in the US. Risa asks why and Natsui explains that there is a possibility because of what is currently going on at S-Tel. Yoko asks if Natsui has told Toru yet. Not yet. Natsui reveals that she wanted to quit at first, but she doesn’t hate the job and she does want to help people…plus, the nightmare of job hunting again… Risa puts her veil on Natsui’s head and tells her she can just get married then. Natsui twirls to face the mirror and smiles at her reflection. She then says she chose employment to become more confident. She then flashes back to what Toru said in New York. She wishes to become even more mature for him. Risa yells that Natsui cannot break up with Toru and the problems with long distance relationships. Yoko replies that everyone is different. Natsui then says that she is sure someone like Yoko would have no problem living in peace with Toru. Yoko asks what she means and Natsui tells her she will know if she visits Toru’s place and lives with him. Natsui then says that its impossible for Toru to live with anyone. Natsui then reveals that Toru said it was better when they were apart. Yoko and Risa are shocked by this. That was a very mean thing for Toru to say. Natsui says if things are like this then she will go to the US after all. Yoko reminds her that she must tell Toru about it and Risa says she will help by seating them together at the wedding. 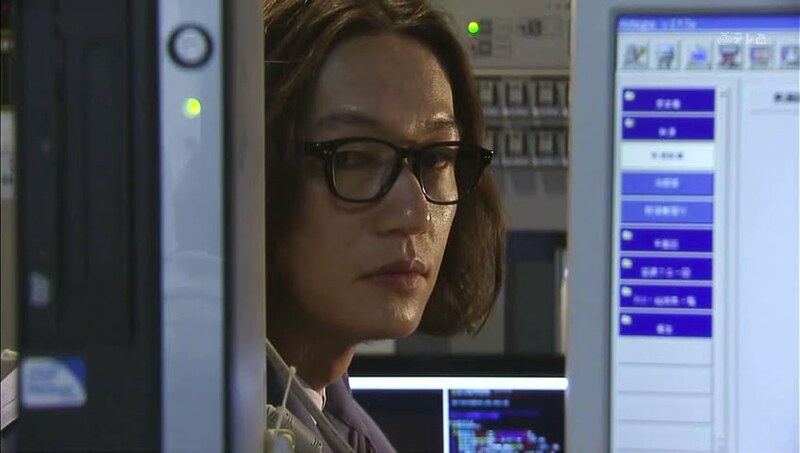 Toru is busy working when he hears the news about S-Tel being acquired by an American drug company. He then recalls Natsui trying to talk to him when he was ranting about his employees. He immediately picks up his phone and tries calling. He doesn’t get through. He then tries the GPS function, but that also fails. What is she doing? Such a stubborn reaction. Toru goes home and the place is empty. All of the things that Natsui brought in are now gone. 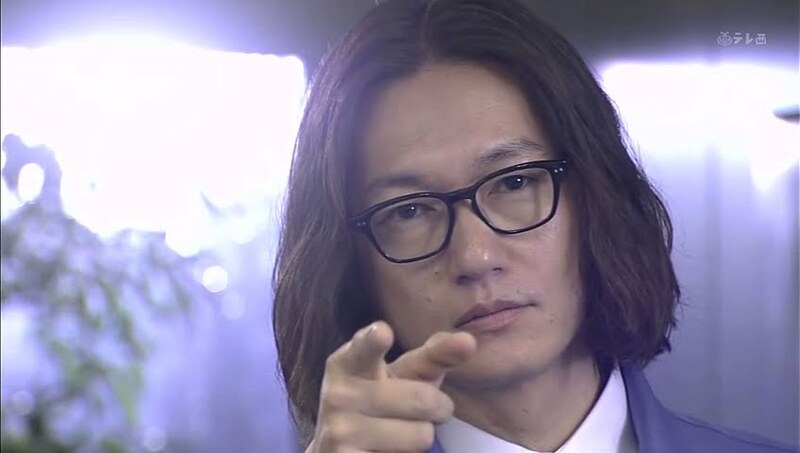 Toru then sees a note saying Natsui is leaving and will see him at the wedding reception. A note again? What a repetitive person. Toru sits down lifelessly on his couch. That is his room. A few days later Toru wakes up on the floor and sees Natsui’s note under the couch. He grabs it as his phone rings. 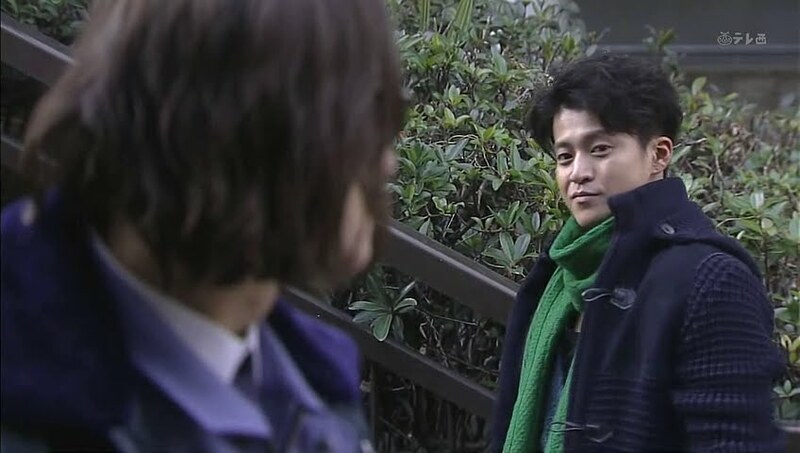 It’s Yasuoka reminding him about the wedding. Toru says he has not forgotten. 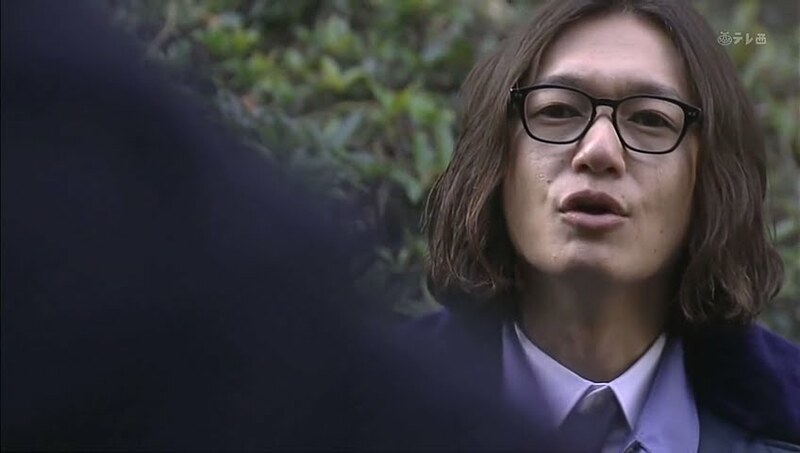 Yasuoka reminds Toru he asked him to give a speech. Toru says he remembers, but just doesn’t know what to say. Yasuoka tells him it must be deeply moving. The call ends and Toru recalls Natsui’s words about him not changing. The phone rings again and Toru answers it wit he’s thinking about what to say. It’s not that. 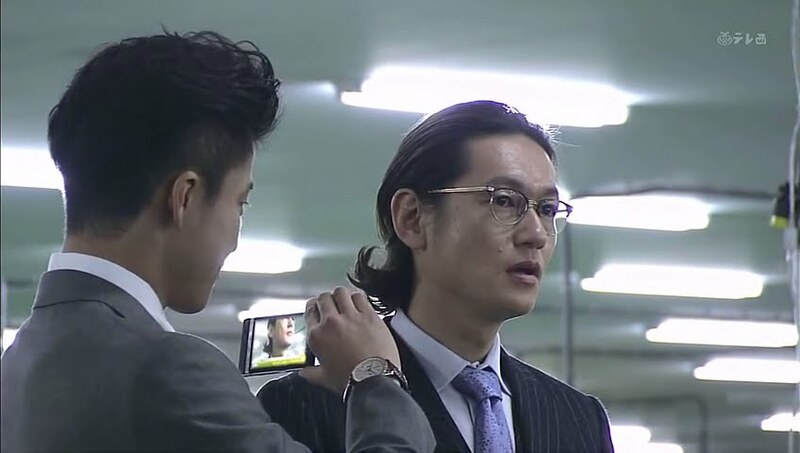 JI Tech…Toru immediately grabs his tablet and does a quick search for JI Tech news. The company has gone bankrupt and 20,000 people will be out of jobs. 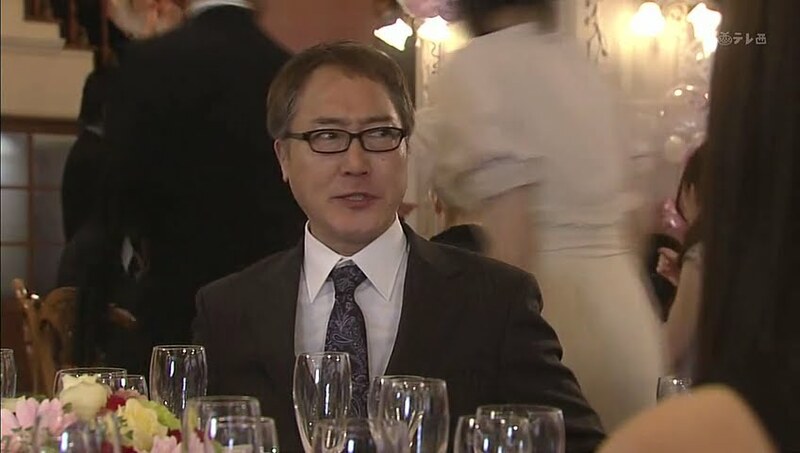 Yasuoka says it doesn’t seem like the right time for his wedding. Toru tells him to get married while he takes care of everything. Toru goes to the bathroom to wash his face. He reaches for the hanging towel, but it’s gone. Why isn’t it there? He then grabs one of the folded towels. At the reception, Natsui reveals to Yoko that she’s leaving for Boston later. Has she had a chance to talk to Toru? Not yet. She was hoping to do so at the reception, but he hasn’t shown up. Yasuoka then calls for for everyone’s attention. 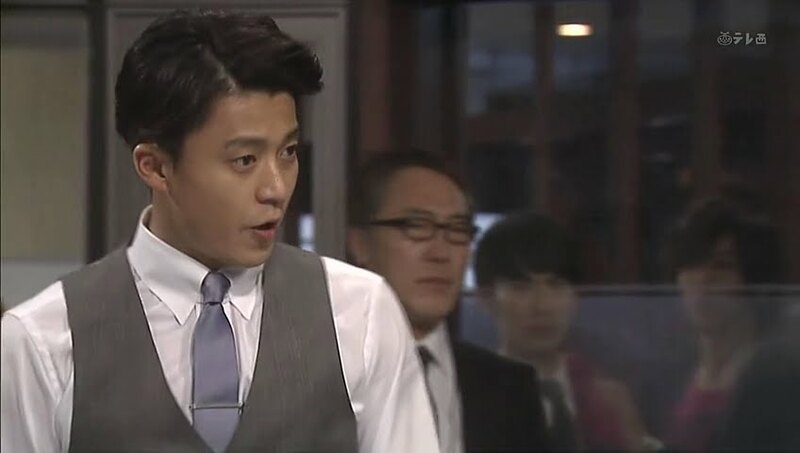 He explains that Toru had urgent business and thus couldn’t make it, but he taped his speech and sent it to the party. 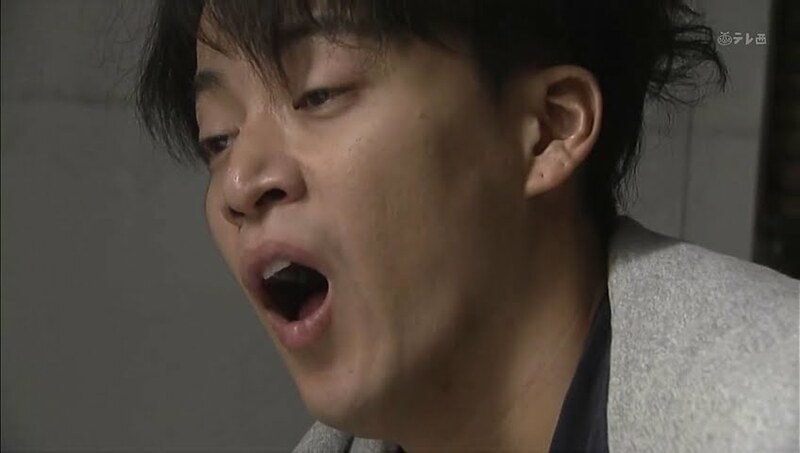 The video starts and we cut to the kitchen where Nogi says he finds it weird that Yoko is cheering for her rival in love. He then asks Yoko to lean on others more—in particularly him. Awww. This makes Yoko smile. Yoko tells him to just come out and confess if he likes her. LOL. In the video, Toru talks about how he was desolate when Yasuoka initially chose to abandon him when he was kicked out of Next Innovation, but when the man came to join him later, he was really happy. Thus, Risa is a lucky woman as such a man is hard to find. 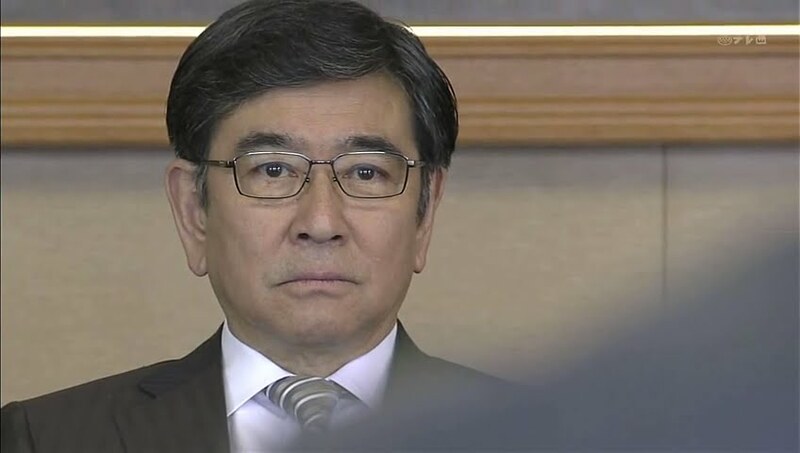 We then cut to Toru meeting with the JI Tech higher ups and asking them to use the personal file project to rebuild their company; however, they must not think of immediate financial gain. This shocks everyone there. Toru then explains if they installed 10,000 P-boxes (equal to the number of post offices and banks) the profit becomes 50 million. Each year maintenance fees will bring in around 150 million. Isn’t that great? Toru says it is only as long as people continue to use the machines. Toru takes out his phone. People will be wanting to access such things on their phones. This is an era where even PCs could potentially disappear so what about an ATM. This means they need to support all mobile and tablet platforms. There is over 100 different types—wouldn’t this strangle the company instead of rebuild it? Toru smiles. You just make personal file open source This shocks everyone. Give the companies the source code at no cost and have them do the compatibility development themselves. This also solves the security issues. JI Tech balks at this, but Toru tells them to have some faith. Their system has been well refined, soon their app will be as commonplace as texting. But there has never been such a wide compliance and cooperation between large rival companies before? This makes Toru’s day. Oh, dear. It’s never happened before? Just because it hasn’t, doesn’t mean it can’t. Toru then reveals the American engineer’s snub on the Japanese technology development. JI Tech was once the leader in Japan technological innovation, so there are still things the company can do. If JI Tech can change, so can their country. This makes the head smile. Listening to Toru makes him believe anything is possible. He agrees to Toru’s proposal. It won’t hurt to try. The plans to proceed immediately go forward and Yamagami says he will have to join in as well. 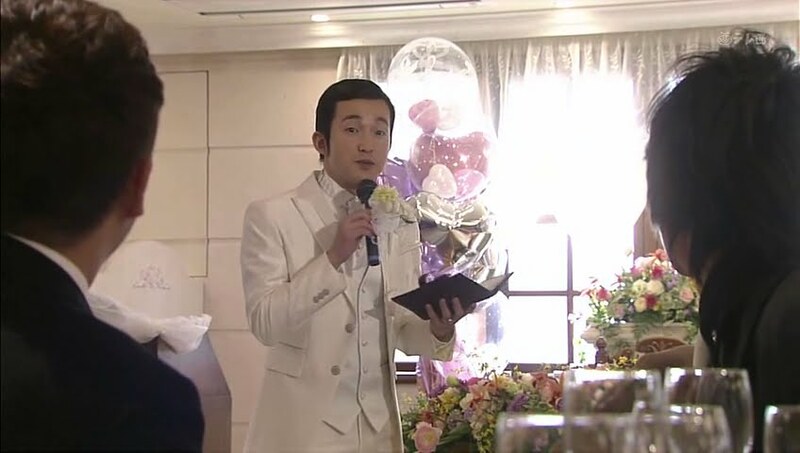 Yamagami goes to the reception and apologizes for being late. He tells them that the P-box idea has been scrapped and something even greater is about to happen. This excites everyone. What is Toru doing next? Enter Toru and Natsui seems rather uncomfortable. Toru looks at his seat and wonders why it has to be there. Natsui pounds on the chairs and demands to know if sitting next to her is really that bad. Toru sits and wonders when her drunken behavior will change. Yep. This girl is a horrible drunk. The others get up and leave the table to prepare for the last event. 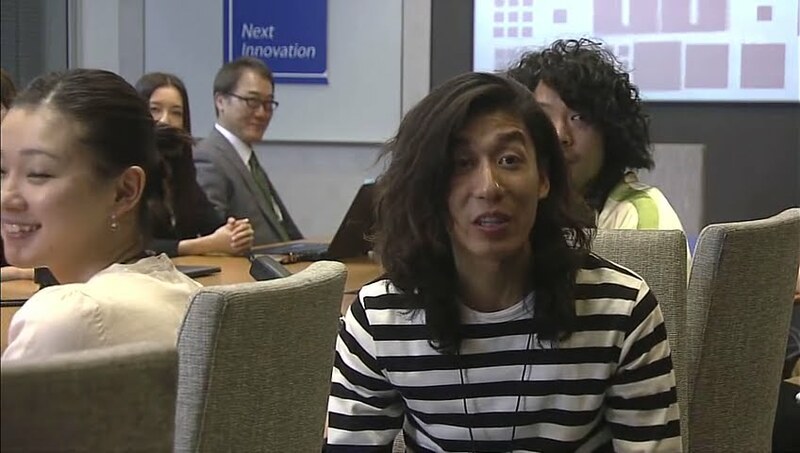 While the Next Innovation employees are performing, Toru asks why Natsui didn’t just talk to him if she was worried about the takeover. How could she when it was a company secret? Shouldn’t Toru have guessed? 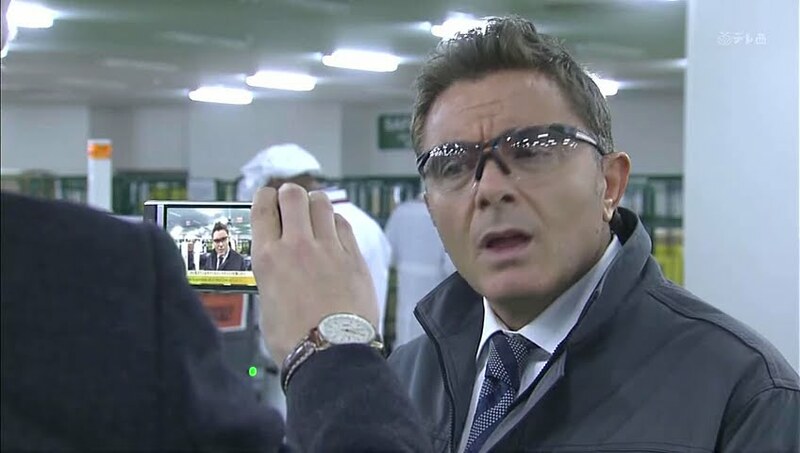 Him? Why should he have guessed it? Natsui says because when they are together he should sense something is off. Toru says he couldn’t sense anything and Natsui says she knew it. The two then look at Risa and Yasuoka. Toru says they look happy and he wonders if he and Natsui can be like them. This makes Natsui laugh. That kind of Toru is impossible. Toru asks what kind of person she thinks he is. She coughs and and he pats her back. Just imagining it is fine. He then says that he is happy he got to see her today. Natsui says she is happy as well as it would be hard for her to leave for Boston otherwise. Toru apologizes and Natsui tells him that is okay since she said some horrible things as well. Toru says they weren’t as they were the truth—he would have trouble learning to live with someone. Natsui also says that’s he knows she can be annoying after awhile. Toru smiles and says she mostly just talks too much. Somehow they always end up hurting each other, don’t they? Natsui says this is because they know each others weak points from having gone through the worst moments together. Toru says it felt like they were fighting together. Like buddies or comrades? Toru says yes—like they were good partners. They then return their gazes to the loving couple and Toru says they can’t be like that. Natsui smiles and fights back tears as she says they probably can’t. He tells her she didn’t have to agree. Yasuoka and the Next Innovation group then come over for a picture. Toru says that if they think alike then they can get along surprisingly well. That’s right. Thus…they should break up. Sigh. Right. That makes perfect sense. Eyeroll. Toru wishes to break up before they can hurt each other any more and avoid even deeper wounds. Natsui says he is probably right. If you think about it, they haven’t even really dated and thus there is no real memories. Toru agrees. Along that line of thinking, they were probably mismatched from the start. Natsui says it doesn’t really feel like a break up and Toru tells her she must start a new life fresh. Natsui says texting and the GPS will keep them linked. Toru then says they should break off all contact. So…is this the end? It seems like it. Toru then changes the subject and says she looks good. This surprises Natsui. He then repeats that the outfit looks good on her. Natsui thanks him and he tells her that she looks like a full grown woman now. 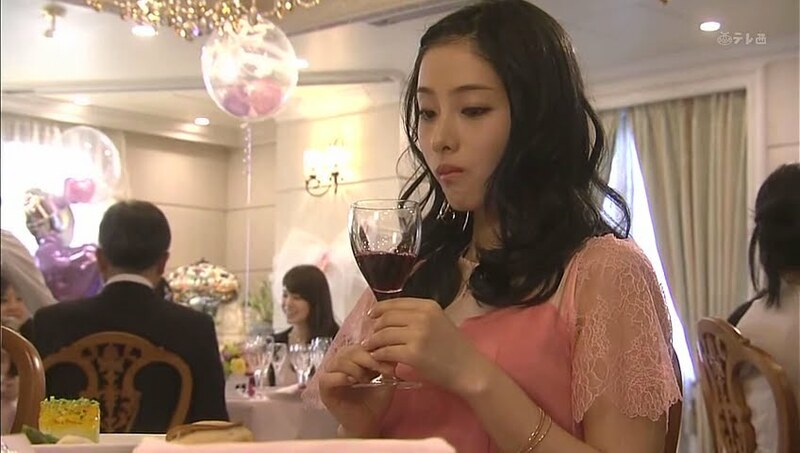 He then quickly downs two glasses of wine as Natsui does her best to fight back her tears. Natsui is on the plane to Boston with her coworker. She is drunk from the reception and crying and yelling and complaining about her breakup with Toru. She complains about him being so self-contained. She yells for him to be happy forever living alone the idiot. Wasn’t he the one who told her to stay by his side? We cut to Toru who despondently arrives home where he sees Natsui’s last note on the couch. He picks it up and crumples it. A few weeks later Toru is having a meeting with his employees. He’s changed his tactic and is not complaining. He sees his company as being one where people come up with new ideas. He is willing to listen to what his employees have to say with that idea in mind. If they say they don’t want to do something because it’s too hard, or it isn’t fun enough then they should leave now. Toru leaves and then comes back and tells them about making the personal file project available on all devices. This excites his workers and he asks them to keep working hard since they won’t fall behind the competitions. Asahina is at work when he sees the article about JI Tech and Next Innovation. He recalls Toru’s vow of fighting until Asahina wishes to return and Natsui asking if he won’t change. His partner then comes in and says he’s lucky to be Asahina’s partner. This makes Asahina laugh. Asahina then says he’s not good as Ito’s partner. He then says that the future is bright after all. Looks like the old Asahina is back. He goes to visit Yoko and is surprised to learn just how many part-time jobs she has. She says it can’t be helped since she wants to save up for her own restaurant. He then asks after all of his stuff. Yoko then says it’s all back in his room at home safe and sound. Toru is in his office working on ideas when a photo of Natsui pops up from their New York date. He remembers her happy smile and saying that it is unreal being together with him. He takes out his phone and hesitates. Will he call her? Meanwhile, Natsui is busy working in Boston. She pulls out her cell and notices that it is dead. She plugs it in and sees a missed call notice from someone in Japan. Who? she then recalls Toru angrily telling her that she is not allowed to miss any of his calls. At this time Yoko calls her and complains about her being silent for so long. How can Natsui live properly if her phone is always dead? Natsui replies that is okay since she is always in the lab and has no one to call or text anyways. Yoko wonders if this is just an excuse to deliberately avoid calls. Natsui replies that isn’t true and asks what Yoko wants. Yoko wishes to know how come the two broke up. Natsui replies that they were never officially going out anyways. How so? They were merely work partners. Flashback scenes inserted here. We then cut to Toru all angsty and depressed. He can’t stop thinking of Natsui. He leaves the office and looks up at the building. We are getting more flashback scenes f rom his and Natsui’s times together from the series. We then cut to Natsui talking about how she was dragged into this and how she is happy as long as she was at least a little helpful to Toru. It wasn’t really about love after all. The drama’s theme really does work well with this song. I find this scene with her annoying because Natsui is in denial about their real relationship. IT was all work and not love. That wasn’t true at all. 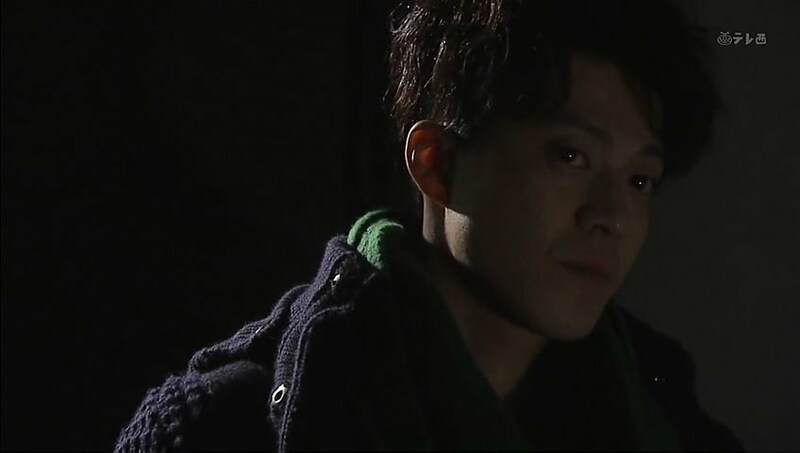 Toru returns home to his dark and empty house and says all depressed that is his home. 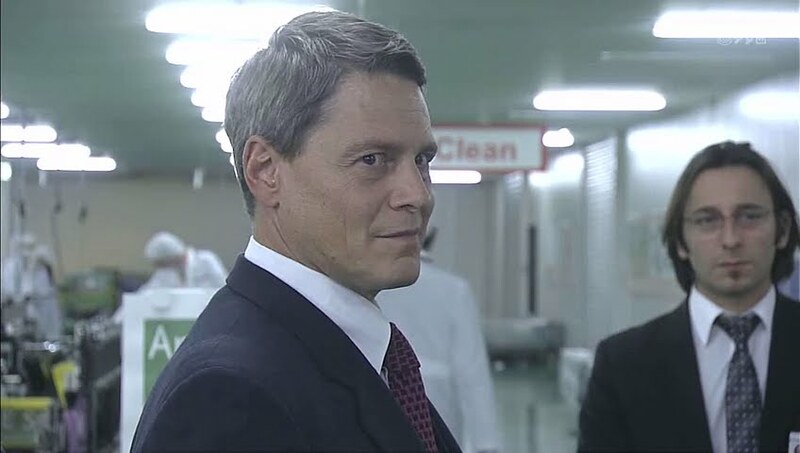 Toru again goes to New York where the factory again rejects his offer. Toru asks them to listen before saying something is impossible. The owner says if Toru agrees to pay double, then maybe they will think of it. Enter Asahina who instructs Toru to not buy—even at half price. This makes Toru grin. He turns to face his friend. Asahina places his hand on Toru’s shoulder and says the negotiations are over. He then switches back to English and tells the factory owners that a Japanese company is making a hard disk with 2 terabytes per inch. Doesn’t seem possible does it? This shocks the US company. They’ve never heard of such a feat. It’s been kept quiet as it is in the development stage. Who is producing this technology? None other than JI Tech!!!! This even surprises Toru. Toru chides Asahina for keeping such technology a secret. Well, it’s not perfected yet. A group of eccentrics willing to work hard inevitably lost their funding for the project. So they just need to hire these engineers, right? Asahina hands him an outsourcing agreement that just needs his signature. That means they will also need a factory. Should they buy this one? Toru then turns to the Americans and smiles as she says “Made in Japan will be back.” He and Asahina then turn to leave and the owner is completely confused. Just who is Asahina? Toru smiles and tells them that Asahina is Next Innovation’s manager and Toru’s business partner. Asahina says that the partnership with JI Tech was his idea from the beginning. 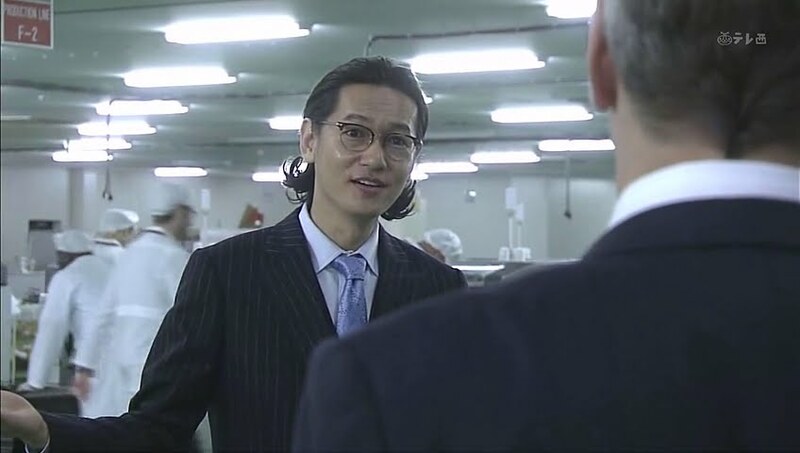 He hands over a plan and Toru asks how he could put such a thing together so quickly. Asahina reveals he did have Yamagami’s help. The boys are back in business again. Asahina goes to leave and Toru asks about his changed image. Asahina says he has remade himself to be bolder—does Toru like it? Toru does. Natsui is at a café in Boston where she gets texts from Yasuoka from the honeymoon. He also reveals that Toru is in New York heading to Boston for business. He encourages her to call Toru. Meanwhile Asahina is encouraging Toru to meet with Natsui. Soon, Risa and Yamagami are all gaining up and texting Natsui to encourage her to meet with Toru. 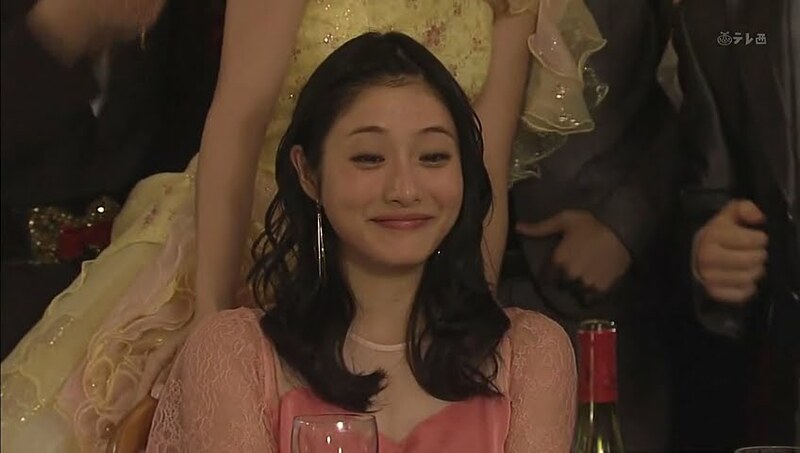 Risa even sends a video of all of Toru’s failed video speeches. In them Toru complains about Natsui and her attitude, but also says how much he likes her and that no matter what he does she always stays with him. He then complains that he has hurt her and that she is better off without him. Natsui cries and calls him an idiot. She goes back to the lab to work, but her heart is definitely not in it. She checks her watch when a coworker comes in and complains her phone never stops ringing. She apologizes and goes out to take the call which is from Asahina informing her that Toru is in Boston and she needs to hurry to him. Natsui asks why everyone is doing this. Asahina says that everyone has agreed that she is the only one for Toru. She yells out that Toru doesn’t need her. Asahina then reminds her of what Toru said about him liking his current self because Natsui changed him. Toru is walking around Boston with some time to kill before his meeting. He thinks about Natsui. She is there somewhere and wherever she is at, she will surely be making a lot of noise. He then sees Natsui. At first he thinks it’s just a hallucination, but it turns out to be the real person. She is asking for directions to get to the building where his meeting will be. She rushes past him and he coughs to get her attention. Natsui finally turns and is shocked to see him. Toru stands toe to toe with Natsui and looks at her closely. He then says he’s done. What? Say what he wishes to say. Toru goes and sits back down. He’s done. All he wanted was to see her face. He’s done that so he’s good now and she can leave. Natsui breaks down and cries. She can’t. She can’t forget him. She thought there would be nothing to remember, but everywhere there is something to remind her of the good times an the bad times. She vows to do her best to change for him so she is less annoying. So…can’t he change, too? Natsui then says she knows she’s asking for the impossible since he can’t change. Toru complains that Natsui is not letting him talk. She doesn’t need to as she knows what he will say. Is that really the kind of person she thinks he is? Natsui then reminds him that he was the one who said that she kept him from being himself. Toru admits that he did say that, but he was a brat at that time. This surprises Natsui. 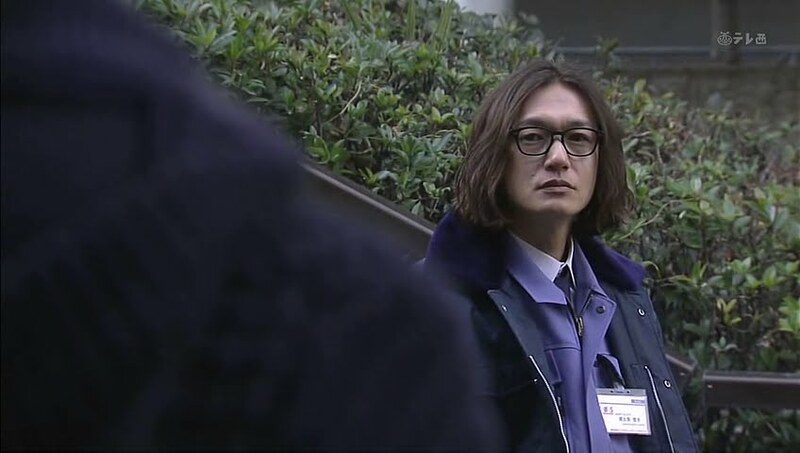 Toru says that acting as his former self was cowardly. People can change. Natsui doesn’t get it. What is he trying to say? Toru stands and says it’s easy to change himself if that is what she wants. He then leans down and kisses her. He then straightens up and says if it is for her sake, he can change. The girl just stands their at first looking completely shocked before laughing and crying a bit. She then asks him to demonstrate. How? Call her name. He says it’s impossible and it is time for his flight. Natsui grabs her stuff and chases after him. On the flight back to Japan Toru gets a text. He complains that she has started already, but he is happy as he looks at her message. She says that she will fill up his closet. Things will be untidy it looks like. He then puts her messages into his personal storage and snuggles in to nap. We then cut to where the series left off with Asahina coming back to the company and Natsui returning back to Japan for good. Toru takes her back to live at his place. He says he will allow the hanging towel, but without the bear design. This makes Natsui happy. He then throws something at her head and she catches it. She complains that he threw it at her and he says that it is “Makoto’s.” This makes Natsui super happy. She asks him to say it once more. He does and she kisses him. She then says his name and he tells her one more time. You’re welcome 🙂 and, yes, you can. Does that translation device actually exist??? It was an app for a cell phone supposedly designed by the computer genius…so who knows? It would be cool if it really did and was accurate. 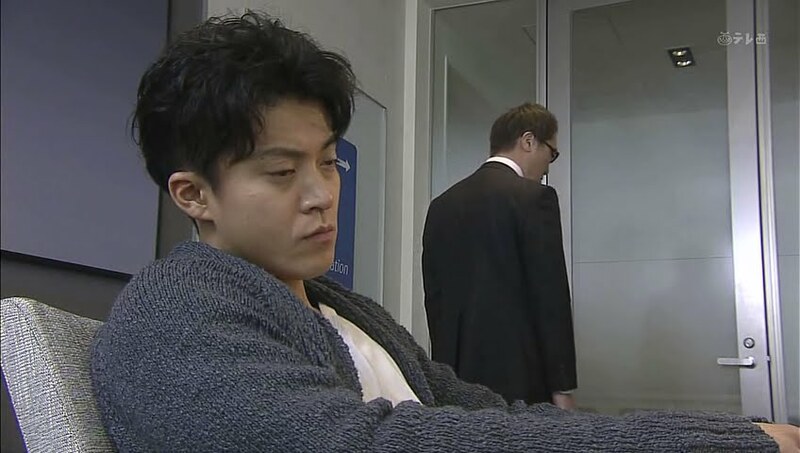 I came here from your “five years as a drama blogger” article, I loved “rich man poor woman”, one of my favourite dramas, Oguri Shun and Satomi Ishihara had great chemistry. Mine, too! Their chemistry was awesome and they will remain one of my favorite OTPs in dramaland.